NCHA includes Beltrami, Hubbard, Clearwater and Lake of the Woods counties. 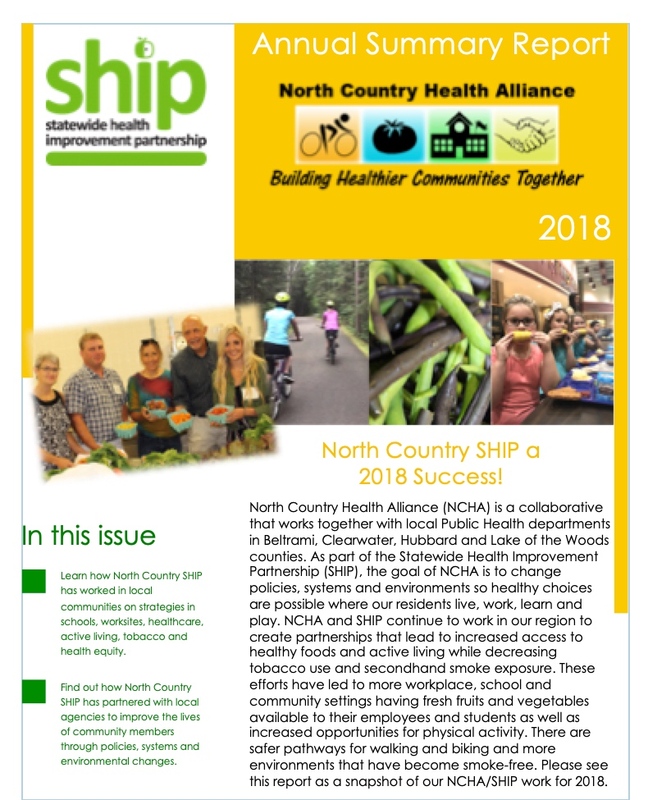 NCHA works to improve public health through grant funded projects such as SHIP and CTG by building healthier communities together. SHIP is about creating good health for parents, kids and the whole community by decreasing obesity and reducing the number of people who use tobacco and are exposed to tobacco smoke. The Statewide Health Improvement Program (SHIP) aims to help Minnesotans live longer, healthier lives by reducing the burden of chronic disease. The overall mission of SHIP is to decrease healthcare expenditures in Minnesota. Statewide Health Improvement Program (SHIP) activities are designed to: 1) increase the number of healthy food options available in schools and communities, 2) enhance access to physical fitness opportunities, and 3) prevent tobacco use/exposure. SHIP is funded through Minnesota's 2008 health reform law. Communities impact health. Much of what makes a person healthy depends on where they live, work and play. Keeping a person healthy, especially one with complex needs, often requires community support and a team of clinical and community providers to work together. However, there are currently barriers that make it hard for clinical providers and community partners to effectively work together. Minnesota is testing whether Accountable Communities for Health might help overcome barriers that prevent coordinated care and services when included as part of an ACO model. Simply put, Accountable Communities for Health work to address health problems within communities by coordinating support systems to keep people healthy. The population can include the people in a county or other geographic area, a patient population, smaller segments of a community, or other arrangements. The Accountable Community for Health must put forward innovative proposals and strategies for coordinating care across settings. Check this out from Brown County MN! OBesity rates on the decline in MN!